Everton boss Roberto Martinez insists they have not received an approach from Swansea for striker Steven Naismith. Swans interim boss Alan Curtis admits the Premier League strugglers want the 29-year-old to boost their strike-force in the January transfer window. Norwich have contacted the Toffees about Naismith but, asked if Swansea had bid, Martinez said: "No." 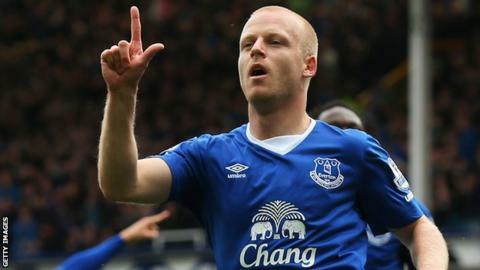 He added that "another Premier League club" has made a "lot of progress" over Naismith's transfer. Martinez's comments appear to strengthen the suggestion that Scotland striker Naismith is set to join Norwich. "Everything is more or less agreed," added the former Swansea manager. "We've only had one approach from a football club who made an approach in the previous window. "We haven't received any other official contact from any other Premier League clubs." The former Rangers striker has started only four league matches this season but scored a hat-trick after coming on as a substitute against Chelsea in September. Naismith is currently sidelined with an ankle knock and Martinez said: "The priority is to see Steven fully fit and available and then we'll probably have a sit down and we'll decide what's the next step." Martinez says Naismith's future is in his own hands "up to a point," adding: "But it has to be right for everyone." Swansea are just one point above the relegation zone after a run of just one win since October and were dumped out of the FA Cup last weekend by lower-league Oxford. Only bottom club Aston Villa have scored less goals than Swansea in the Premier League and Curtis, who is in charge of the Premier League strugglers until at least the end of the season, has admitted the Swans need a striker to boost their survival chances. "Like all good players, if we can afford to bring him in, then we will be interested. "We're still looking for that main striker. Steve is probably someone who plays just behind the main striker but someone we will be interested in." Curtis' attempts to boost his squad in the transfer window are aided by the £12m received from Newcastle for the sale of England midfielder Jonjo Shelvey. "There's a need to strengthen and we've got some money in the bank now, so it's important we spend it," said Curtis.